Art of Psychiatry meeting: Henry Hering “Before and After” speaker Caroline Smith – Thurs 17 Nov – viewing of exhibition in Maudsley Hospital Long Gallery 1745-1815hrs then Robin Murray Rm A in the IoPPN – All welcome! Please join us for our last AoP meeting of the year! We’re delighted that Caroline Smith, Interim Director of the Bethlem Museum of the mind will join us to speak about the current Maudsley Hospital Long Gallery exhibition “Before and After”, and exhibition of photographs of Bethlem patients from the mid-19th Century. 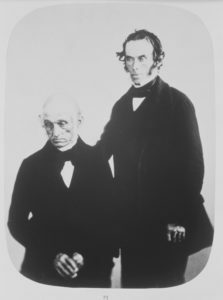 Between 1857 and 1859 Regent Street portrait photographer Henry Hering made several visits to Bethlem Royal Hospital, then at St George’s Fields, Southwark. He photographed several patients on the general wards as well as in its criminal department. These photographs more closely resemble ordinary portraits of the time rather than the ‘passport’ images of later asylum photography and capture individuals who have left little trace in the historical record. It is likely that he was attempting to document what was then known as the “physiognomy of insanity” or to provide evidence for the success of Bethlem’s new regime, though no record of his intentions has been kept. Whatever his purpose, the enduring result is a striking record of institutional life in mid-Victorian Britain. Caroline Smith is currently Interim Director at Bethlem Museum of the Mind and part of a team behind Bethlem’s new Museum of the Mind (opened February 2015). Caroline also works as a freelance lecturer on painting and the history of art. She has a particular interest in early photography and in 2012-13, received funding from the National Portrait Gallery to support further research into the Bethlem photographs of Henry Hering. – Enter the Maudsley Hospital through the main entrance on Denmark Hill. Turn left past the reception desk and follow the signs to the Long Gallery.